HARLEM — Kim Howard proudly points out the items she learned how to make as part of a program that pairs up master artisans and formerly incarcerated women. She looks at the giant wooden telephone spindle table that she sanded and whitewashed. Nearby there's a stained-glass window that she learned how to shape. And there's a silk screen project that Howard began learning about last week. 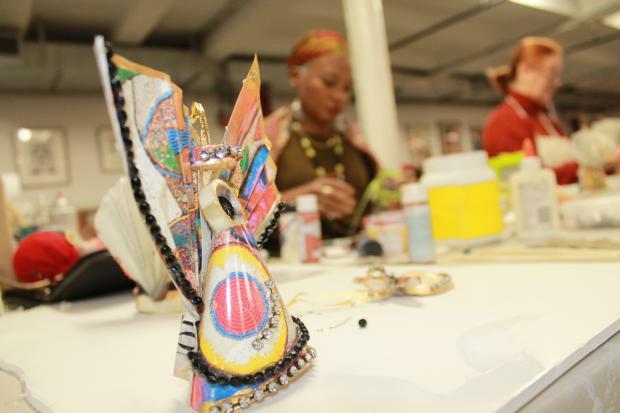 "I've grown and learned and love it," said Howard, 49, who is among the women who participate in the arts collective SoHarlem, which pays local artists and craftspeople to teach women with a history of incarceration or substance abuse to learn a trade. The group partners with not-for-profit organizations as well as private organizations to help give women skills that will help them get back on their feet. 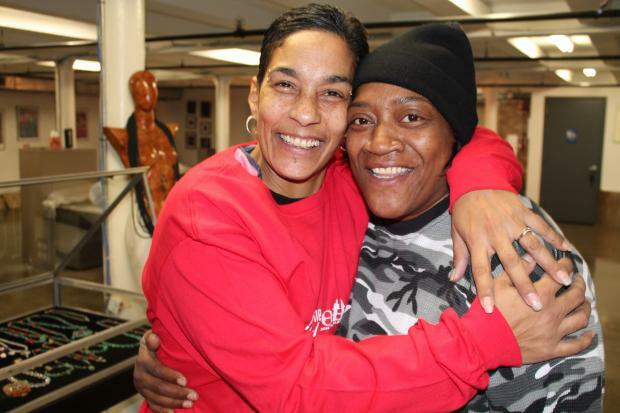 Howard, who is in recovery and is part of East Harlem's Greenhope Services for Women, a comprehensive residential treatment program for formerly incarcerated women, said the artisans she works with, "call on me and depend on me." She said she has come a long way since her substance abuse issues once took her down the road to homelessness and despair. SoHarlem founder and CEO Janet Rodriguez sees the organization as combining two issues she's passionate about: promoting and preserving the arts by supporting master artisans while helping the formerly jailed. "I consider this a social enterprise," said Rodriguez. "It's run like a business, but with a charitable mission." That means Rodriguez hires artists such as Donna Drew, 58, to teach women like Howard. Recently, Drew sat in the organization's loft space at the Mink Building on 126th Street in West Harlem making paper angels from old calendars and shells. The shop was decorated with items she had made such as mythical animal prints and decorative holiday light bottles. Most products at the shop are made from recycled materials. Drew was helping to fill an order for six of the angels with the help of women apprentices. The mostly women artisans and their apprentices at the shop produce everything from furniture to quilts to jewelry and perfume. "We teach these women how to make what we make," Drew said. "We are bringing jobs to Harlem." Rodriguez, a former vice president of the JPMorgan Chase Global Philanthropy Group, came up with the idea after opening Straight Out of Harlem, a shop on 145th Street and St. Nicholas Avenue where she sold art and wearable art from local and global artists. After closing the shop in 2009, Rodriguez realized that straight retail was not for her. Born in East Harlem, she saw the high levels of unemployment as a major problem. At the same time, the difficulty she had running her shop showed how hard it was to support artists in their entrepreneurial pursuits. "I wanted to figure out how to combine the business side with the social needs," Rodriguez said. Now, artisans at the shop are helping to create what Rodriguez calls a cultural workforce. The goal is to help the artists keep creating in Harlem and to eventually earn money from the products they sell. The women apprentices will gain the skills needed for work or to eventually start their own business. "I didn't know how to sew before I came here and I know now. I know how to paint and stain," said apprentice Maria Rosa. "I didn't know I could do a lot of things." Rosa, who is also at Greenhope Services for Women, said she was the type of person who always held a job, but also dabbled in drugs. "I chose to do the right thing and the wrong thing at the same time," said Rosa. It still landed her in trouble. Working at SoHarlem is helping her to find her way back. "I was nervous when I first got here, but I've learned to be more responsible," she said. The artisans say they also benefit. "They get so excited," said Gladys Rosa Perez, who teaches a technique of how to paint on plexiglass. "We get to watch them improve. There's a lot of love and compassion and they treat us like friends and co-workers." Now, Rodriguez has plans to expand her project further. Working with developer Janus Properties, Rodriguez hopes to have space in the redeveloped Taystee Bakery site. There, the artisans from SoHarlem will open their own spaces to sell their products. The women being trained at SoHarlem will be employed at the shop. Rodriguez says her ultimate goal is to put herself out of business by creating a large enough pool of entrepreneurs and cultural workforce so that it is self perpetuating. "I'm not trying to change the world. I just want to start with this small area," said Rodriguez.